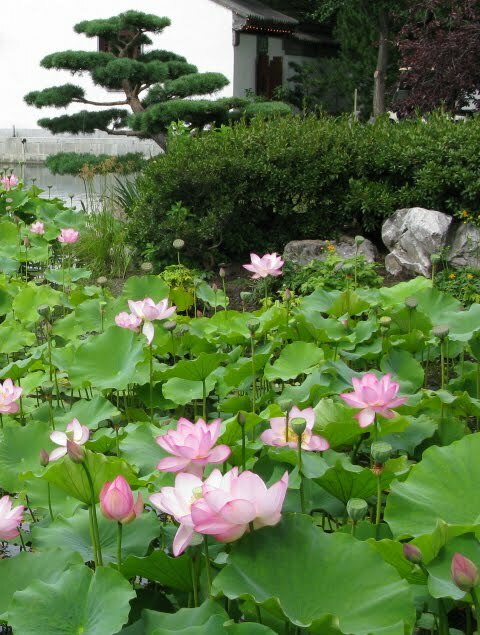 Lotus Flowers, Montreal Botanical Gardens. Photo: Nancy Denkin. Even though I eat and sleep weaving, every so often it’s good to take a break—and this August it was a 500 km (it’s Canada after all; they actually made the switch to metric years and years ago when we were contemplating the same—they got the job done but we, alas….) bike trip along route 1 of the Route Verte bike trail in Quebec, Canada. We followed the swooping Southern path through what is known as the Eastern Townships from Montreal to Quebec. If you have a hankering for traveling by bike, this path, Quebec, its people, and food are wholeheartedly recommended. Even when I’m not actively designing fabric, I can’t help but be influenced by the sights along the way. The Lotus flowers in the Botanical gardens in Montreal had to be the highlight for color and shape. The delicacy of the petals as they swayed ever to slightly in the breeze seemed in some way other worldly. If only I could create a pale, pale pink sheer fine fabric to capture its essence.